For years I’ve argued that the best way to enjoy a garden fresh tomato is to eat it the minute you pick it and let the juice drip down your chin. And last summer, well, last summer I realized that I was wrong. That’s not to say that I’ve stopped eating fresh tomatoes like they’re apples. When the first tomato of the season ripens I stand among the towering plants bursting haphazardly from their cages, their wild, twisting limbs laden with green fruit, and I sink my teeth into my long-awaited prize. Then I pass the dripping tomato to Greg who is patiently waiting by my side, beaming with pride. (I’m pretty sure that eating the first garden tomato of the year without your spouse is grounds for divorce, but I’ve never dared to verify it.) It’s my favorite rite of summer: the savoring, the sharing, the reward for months of patience and hard but pleasurable work. Admittedly, that first bite into pure unadulterated summer is hard to beat. But what if there was a way to make those juicy tomatoes taste even better? Yes, better. And what if that way not only improved on perfection but gave you a means of preserving your treasured harvest long after the first frost settles on your withered tomato vines? I give you the Melted Tomato, a.k.a. the Roasted Tomato, or as I’ve come to think of it: my winter salvation. Roasting the tomatoes concentrates their immensely satisfying flavors and adds a bonus–a sweet, almost caramel note that you can only get when tomatoes are roasted. I know, I know, I had you at caramel. Don’t blink or you’ll miss the recipe: Put tomatoes on a pan, drizzle with olive oil, sprinkle with salt, and roast at 375°F until melted. Store leftovers in a jar and cover with olive oil. It’s that quick and that easy. And as Ben Franklin famously said, “An ounce of prevention is worth a pound of cure.” Then when Old Man Winter tightens his grip on you, reach for your melted tomatoes. Toss them with penne pasta and a little garlic. Sprinkle them on a pizza. Or smear them on a slice of crusty bread. They can do more to lift a dour mood than an anti-depressant, vitamin D supplement, or sun lamp. Place tomatoes onto a rimmed baking sheet. Generously drizzle with olive oil. Roast until tomatoes look limp and melted, about an hour. Place hot tomatoes into a sterilized jar leaving at least an inch of head space. Cover tomatoes with olive oil so that no part of the tomato is above the oil line. Refrigerate until ready to use*. *note: The olive oil will solidify in the fridge. 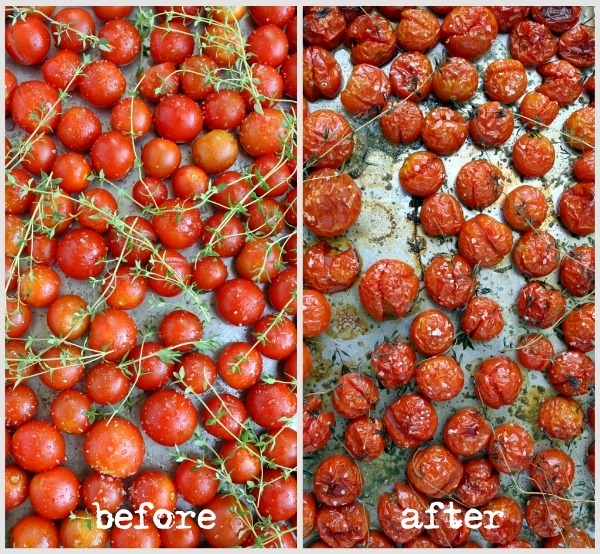 Scrape it back, take out as many tomatoes as you need, and smooth the oil back over the tops of the remaining tomatoes. Keeping the tomatoes covered with the oil is the secret to their extended shelf life. I have had the pleasure of sampling these….I can’t wait to make my own. They are delicious!!! What a great idea to preserve these gems and chase away the winter blues. 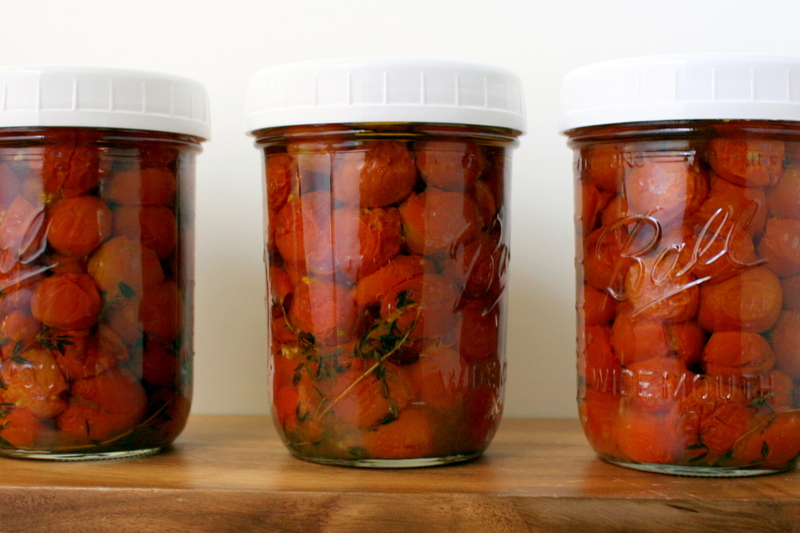 I usually just freeze my roasted tomatoes but storing them in olive oil sounds so much better! So simple and pure. Thanks! Hi Bobbi–can I do this with tomatoes other than cherry? I have loads of medium sized orange tomatoes that I am trying to figure out what to do with. Also–you’d be proud of me…we brought back 25 lbs of peaches from Michigan and I made some jam and canned three beautiful jars for the first time. Wasn’t hard at all! So, for the tomatoes, can I seal and store them in the pantry or do they have to be refrigerated? I love cherry/grape tomatoes. What a great idea! Wow! Can’t wait to try this. I love this recipe but I have one question. I made one batch as a tester but couldn’t get the excess liquid from the tomatoes to cook out and they seemed kinda runny? They still tasted great and they are packed away in my fridge but I’m wondering if I should have done something different? I ended up roasting them for about two hours! Help! I want to make more!! Sorry to leave you hanging. There are three factors that can affect the oven time: size of tomatoes, tomato type/water content, and oven temperature. Yes, sometimes you need to extend the baking time. But it’s also ok to have a wet batch. As long as tomatoes and their juices are below the oil line, you’re good and the tomatoes will keep for months. Resist the urge to increase oven temp-the tomatoes will char too fast. What is the shelf life of these, and do they have to be refrigerated? Yes, the tomatoes are stored in the refrigerator. If the jars and lids are sterilized and all the tomatoes are submerged below the oil line they will keep for months. I made 8 jars last summer, and we finished the last jar the following May-eight months after they were roasted.